Eggs are packed with protein and they’re low calorie too. Try these heart-healthy egg recipes. Eggs are nutritional powerhouses. Photo by Getty Images. Sunny-side-up or scrambled, poached or fried, the egg is a versatile food. And they are nutritional powerhouses. Eggs have been much maligned over the years. And a recent study may have alarmed some cardiac patients. But don’t let the bad press worry you. Feel free to hop on over to the fridge and pull out some eggs. “They’re a very low fat, low calorie, nutrition-rich choice,” said Jenifer Bowman, a UCHealth cardiac dietician who works with patients in cardiology clinics and hospitals throughout northern Colorado. 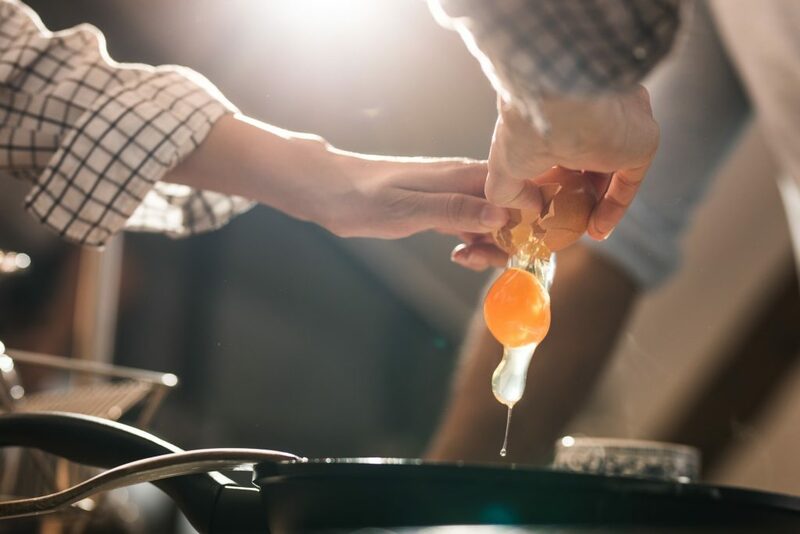 “I tell my cardiac patients that they can have as many eggs as they want within the context of a balanced meal,” Bowman said. She said the newest research from the American Heart Association shows no link between dietary cholesterol and negative cardiovascular outcomes. And, the newest dietary guidelines from the U.S. Department of Agriculture, which were updated in 2015, do not urge people to limit their egg intake. Eggs are packed with nutritional benefits. The yolks are one of the biggest sources of choline (second only to liver), which is important for the nervous system, memory and mood. They contain omega-3 fatty acids, which help prevent blood clots and inflammation, and help reduce blood pressure. And they have various minerals and vitamins, including B vitamins and the fat-soluble vitamins A, D, E and K.
In addition to packing in protein, eggs are a great source of antioxidants including lutein and Zeaxanthin, which are great for eye health. Try making your own breakfast burritos. They are simple to make and delicious to eat. Breakfast burritos are a perfect balance of calories that will keep you full and going all morning. Make several dozen at one time and store in the freezer for a quick, nutritious breakfast on the go. In a large nonstick skillet, heat olive oil over medium-high heat. Add onion and sauté 3-4 minutes. Add potatoes; continue to cook until potatoes begin to brown, stirring frequently. In a large bowl, combine beaten eggs, milk, cayenne pepper and green chilies. Pour egg mixture over browned potatoes and scramble until eggs are cooked. Assemble burritos by spooning about 1/3 cup egg mixture onto a warm tortilla. Add 1 tablespoon each of cheese and salsa on top of egg mixture; then roll into a burrito. Allow extra burritos to cool then wrap tightly in plastic wrap and place in a freezer zip top bag and freeze for future use. For a quick breakfast on the go, discard plastic wrap and cover with a paper towel then microwave for 3 minutes. Makes 20 burritos (serving size: 1 burrito). 264 calories, 6gm fat, 2gm saturated fat, 12gm protein, 37gm carbohydrate, 319gm sodium, 5gm fiber. This is a very simple recipe that can provide a vegetable serving when eaten for breakfast or can be used as part of a main dish evening meal when served with a salad. Any time of day, it is delicious. You can make good use of leftover vegetables by using them in this recipe. Preheat oven to 350°. In a medium skillet, heat olive oil over medium-high heat. Add onion and garlic; sauté for 2 minutes. Add mushrooms and tomatoes; continue to sauté until vegetables are tender. In a large bowl, lightly beat eggs. Add sautéed vegetables, artichokes, spinach, Italian seasoning and cheese to egg mixture. Blend well and pour mixture into an 8×8-inch baking dish coated with no-stick cooking spray. Bake for 45 minutes or until firm. Makes 6 servings. 189 calories, 11gm fat, 5gm saturated fat, 14gm protein, 9gm carbohydrate, 370mg sodium, 2gm fiber, 204mg calcium. Of course you can eat egg salad. To lower the fat, use a low fat mayonnaise and use a little less than usual. A quick, tasty way to add protein to a meal or a snack. Make this recipe your own by adding a variety of vegetables, different pickles, mustards, seasonings or spices. Nutrition Facts per 1/3 cup: 105 calories, 8gm fat, 2gm saturated fat, 6gm protein, 1gm carbohydrate, 271mg sodium, 0gm fiber, 150mg omega-3 fats.